This week’s number in the real world: Building floor numbers! 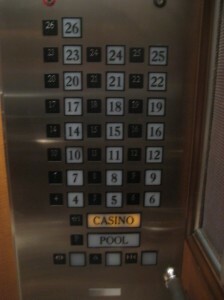 How easy it is to navigate a building when one knows to go to Floor 6, or 26, or 126. Interestingly enough, in this particular hotel (The Bellagio in Las Vegas), the floor I was most interested in was not a floor that was numbered. And now, for a non-number note: Are you all aware of the bad things that can happen when one steps into an elevator? Last summer, I was in Concord, NH. As I was getting into the elevator at my hotel, I tripped, which caused my rental car keys to become dislodged from my pocket. And in what can only be called a very cruel twist of fate, my car keys turned “just right” and fell down the crack between the elevator and the door — yes, they fell down the elevator shaft. Like really? Did that really happen? Yes, it did. At the time, I can remember thinking, “Wow! I need some alcohol.” Unfortunately, I had no way of getting to a liquor store since my car keys were now at the bottom of an elevator shaft. I told the front desk clerk what happened; she called and left a voice mail for the maintenance man. While I waited for the maintenance man to call back regarding The Case of the Keys in the Elevator Shaft, I started thinking about how in the movies, people are always climbing up and down elevator shafts. I was hoping that the maintenance man had seen some of these movies. Alas, if he had, they didn’t inspire him to climb down his own elevator shaft. He said I would have to wait until the morning when the Elevator Man could come and retrieve my keys. So I did, and he did. The lesson learned: If you’re on an elevator with a “casino” option, odds are that you won’t care if your keys fall down the elevator shaft; if you’re on an elevator in Concord, NH, odds are that you will.